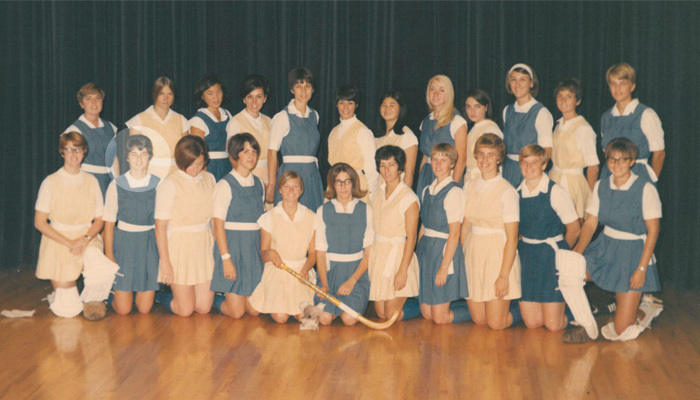 If it weren’t for a fire at a peach cannery, Carolyn Lewis never may have discovered collegiate field hockey. The San Jose State freshman worked nights at the cannery, and though she was already an experienced high school and club volleyball, basketball, softball and field hockey player, she had not considered playing sports in college. And then, one night, the cannery caught fire, requiring a weeklong closure—just enough time for Lewis’ little sister to convince her to sign up for field hockey camp. There she met San Jose State field hockey members and she fell in love with the game, the camaraderie of the team, the focused attention and support of her coach and mentors. Despite the emotional support she felt from her peers and coaches, it was hard to ignore how differently female and male athletes were treated. This was Silicon Valley in 1966; the Valley of Heart’s Delight. Women’s sports were extracurricular—they were not a career. She had learned this in elementary school, when girls had to play softball on asphalt while the boys played on grass. Why else would there be college athletic scholarships for men but not for women? Men’s sports were serious; allegedly they required a focus and commitment that demanded more attention, more time, more faculty, more staff—and perhaps most controversially—more money. These were the messages that Lewis internalized while competing in four college sports. When she was an undergraduate, woman athletes did not receive any per diem for travel or accommodations, regardless of how well they played. One memorable tournament involved a caravan to Chico State—with athletes driving their personal cars, because there was no organized transportation for women’s sports—where the field hockey team spent the night sleeping on the floor of the men’s wrestling gym. The next day they lost the game, though, as Lewis says, they “didn’t lose much after that.” Their uniforms weren’t practical either. Woman athletes were expected to wear skirts—not just during competition, but around campus. Looking back on her more than 30 years as an athlete, coach and administrator, Lewis’ accomplishments can be summed up as a series of important, incremental acts of change. To her, the status quo existed to be observed, explored and challenged—all in the name of progress for herself, her students, San Jose State, and ultimately collegiate athletics as a whole. The skill set she developed as an athlete served her well as a teacher, coach and athletics administrator. The very same determination to make a basket, support her teammates or score a home run came in handy when she recognized subtle and not-so-subtle discrepancies between the way men’s and women’s teams were treated. “Learning how to push yourself beyond what you think you are able to do, making a commitment and staying with it, being able to take criticism and realize that it’s meant for the best, thinking on your feet—these are all good attributes to have,” she says. After she graduated in 1970, Lewis taught a year at Leigh High School in Campbell, then moved to Washington to pursue a master’s in sports psychology. Whether she was playing sports or coaching at the college level, she was always keenly aware of the disparity in funding between men’s and women’s sports. Fresh out of graduate school, she coached women’s volleyball, basketball and softball at Cal Poly Pomona. Women were expected to coach multiple sports, as well as teach as college professors. Several times throughout her career Lewis had to grapple with the stark differences in the way men’s and women’s sports were perceived. Was an entire softball team meant to be worth as much as men’s socks and belts? Even if a university did not intend to send that message, how would it make a softball player feel? Though she learned to be a savvy and successful fundraiser, Lewis made it a priority to create as many opportunities for her athletes, women and men, as possible. In 1975, she returned to San Jose State to coach, and later became an athletics administrator. When the Association of Intercollegiate Athletics for Women started offering scholarships for woman athletes that same year, she gave the first athletic scholarship to a woman student-athlete in university history—with a major portion of that scholarship coming out of her own pocket. She’ll never forget the amount ($300) or the name of the recipient (basketball player Lori Stall) because it represented a necessary step toward gender equity in sport. Lewis’ donation kicked fundraising for women’s athletics into gear, inspiring a Run for Nationals jogathon in 1976 to support any team in the department that qualified. The fundraiser was so successful that it inspired the annual Walk for the Women of Sparta, an event where participants could gain sponsorship for every lap walked. In the late 1980s, San Jose State merged men’s and women’s athletics into one department. Women’s field hockey had been a top-10 team for 10 years with Lewis as coach. Her philosophy? To be a good coach is to “be interested in a person’s total well-being,” from sports to studies and extracurriculars. Despite this, the momentum for gender equity in sport that had been sparked with the passage of Title IX in 1972 had begun to slide. Athletics was forced to change its approach to funding sports, and in 1988 that meant cutting wrestling, men’s cross country, men’s track and field and women’s field hockey. Heartbroken, Lewis watched her field hockey players sit outside the university president’s office for four days, waiting to hear why they couldn’t play. As unhappy as she was with the decision, she opted to stay on at San Jose State as the associate athletics director, resolving to “make sure it never happened to any other team again.” Instead of giving up or accepting jobs elsewhere, she investigated the institution of college sports and how she could help create change from inside. What did that look like? Lewis organized and initiated San Jose State’s Student-Athlete Support Services unit in 1988 and the Student-Athlete Advisory Council. Staying true to her promise to increase equity in sport, she helped develop the Gender Equity plan in the 1990s. This meant leveraging support across campus and throughout athletics. Change didn’t happen fast; it was a campus-wide effort, a series of “heart-to-heart discussions” that required breaking down stereotypes that had, knowingly or unknowingly, affected the resources allotted to male and female athletes. Lewis says that she and others had to discourage the belief that woman athletes didn’t mind sharing beds on overnight trips; that women didn’t eat as much as men, and therefore did not require the same per diem reimbursements; that women didn’t care as much about physical injuries or didn’t need their own team physicians. Though Title IX had passed in 1972, it took time for universities to apply and preserve equal access to federal resources—and in San Jose State’s case, it took leaders like Lewis, who brought campus influences together to question cultural norms. Ever the athlete, Lewis wasn’t about to give up on a fight that she knew was worth winning. The Gender Equity Plan succeeded in creating a campus conversation, and was later reinforced by the Equity in Athletics Disclosure Act (EADA) in 1994, which required all coed institutions of higher education that offer federal financial aid to publicly disclose information about their intercollegiate athletics programs. By forcing universities to be transparent about scholarships, resources and salaries, the government helped athletics departments across the nation clarify funding for both female and male athletes. 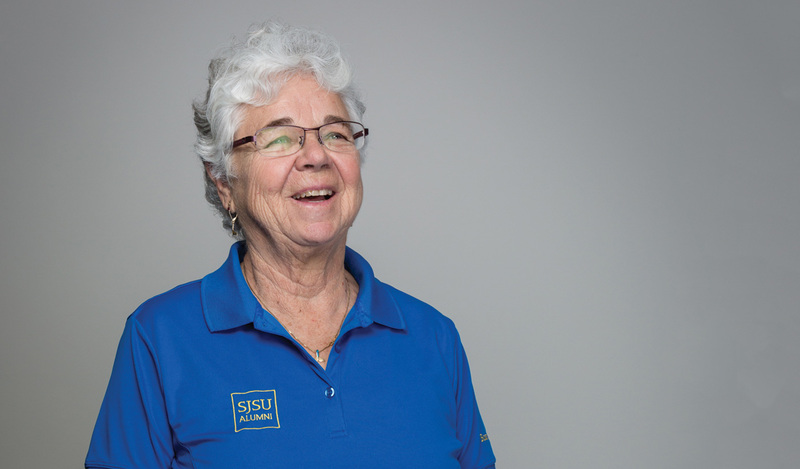 Lewis’ commitment to sport didn’t end when she retired from SJSU in 2003, or even when she was inducted into the SJSU Sports Hall of Fame in 2014. Though she no longer plays competitively, she is still a triple-threat hiker, kayaker and sailor. Carolyn Lewis’ story represents a long tradition of outstanding woman student-athletes at San José State. From Olympic swimmer Lynn Vidali Gautschi, ’76 Kinesiology, ’77 Teaching Credential, to record-breaking gymnast Thomasina Wallace, ’12 Kinesiology, generations of Spartan women have led successful careers in sport. Read The Women in Sport Stories. Do you know of other Spartan women in sport? Do you know of other Spartan women in sport? Share with Washington Square by emailing wsqeditor@sjsu.edu. many lives for women in sports.